Synclavier Digital is excited to announce the release of a new wave of products. We have two iOS apps, Synclavier Go! 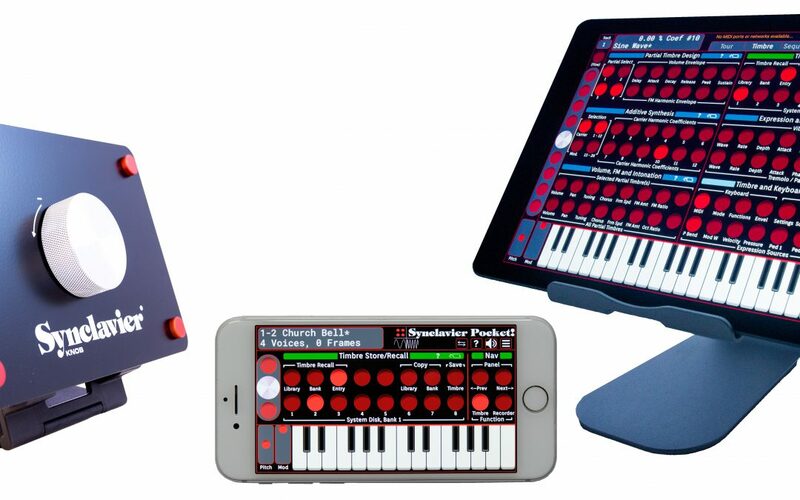 for iPad and Synclavier Pocket! for iPhone or iPod Touch, and Synclavier® Knob. The official release is here! Please come and see us this week at booth 14004 at NAMM 2019 Anaheim California. Synclavier Go! is our flagship product. It’s a fully-featured Synclavier, with 12 partials, 16 tracks, and theoretically unlimited voices. Synclavier Pocket! is an entry-level Synclavier. This baby-sized syth is surprisingly powerful as well as being a lot of fun. It has 4 partials and is mono-timbral. Synclavier® Knob faithfully recreates the knob from the Synclavier II machine. It can be used in conjunction with Go! or Pocket! for parameter setting, effectively reproducing the original Synclavier experience. The Synclavier® Digital Audio System pioneered the computer music age with its commercial introduction in 1978. The CSynclavier DSP Engine – used by Arturia in its acclaimed Synclavier V product line – faithfully re-creates the FM- and Additive-Synthesis functions of the original instrument. Synclavier Go! (for iPad) and Synclavier Pocket! (for iPhone and iPod Touch) now provide an authentic and intuitive touch-screen interface for the synthesis engine. Hi, just to ask if I can use the knob to dial settings with the Arturia Synclavier v? Hi, Brendan. Good question. No, Arturia V is strictly mouse-driven.